In one of the latest releases of the EventHandler module for NetEye 4 we introduce, for the first time, a completely customized form element. In order to satisfy certain EventHandler usage constraints, we needed to create a drop-down element that allows the user to enter a custom value in addition to choosing one of the automatically proposed options. To create such a field we had to extend the ZendForm component library. Even though this is not a complex task, we found it to be less intuitive than we had expected. With the experience gained, I will now give you a short guide on how to create your own custom form element for ZendForm and Icinga Web 2. Define a namespace where you can group all the new form elements you want to develop. Extend the ZendForm class that is most similar to the element you are going to create. For example our aim was to create an advanced selection box, so we extended the Zend SelectElement class. Define the graphical structure and the validators for your new element. Obviously, you can attach a jQuery plugin or effect to your new element. 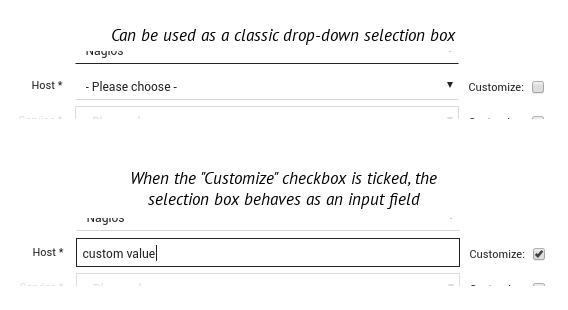 How can you use your custom selection box in an Icinga Web 2 form now that you have created it? As you can see the first argument passed to addPrefixPath represents the namespace, the second is the full path to the element’s class and the third defines which kind of class you are loading.